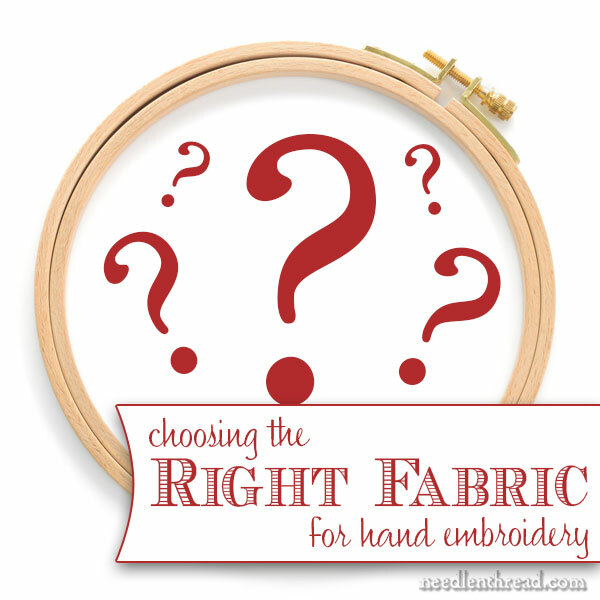 A frequently asked question here on Needle ‘n Thread is what fabric to choose for hand embroidery projects. We’ve talked about testing specific ground fabrics for hand embroidery before (here and here, for example), we’ve discussed linen for embroidery numerous times (here and here are two articles with a lot of information in them), and we’ve discussed building a swatch collection of fabrics that are suitable for embroidery, but in all the years we’ve been chatting about embroidery together, I’ve never itemized what I look for in a ground fabric specifically for hand embroidery. I thought I’d do that today and open up the topic for discussion. Most embroiderers have their favorite fabrics that they gravitate towards, so I’d love to hear about the fabrics you like to use for surface embroidery, the fabrics you avoid for surface embroidery projects, and the whys and wherefores behind your thoughts. Here are my thoughts on the subject – I hope you join in with yours! Before choosing a specific fabric for a hand embroidery project, I always ask myself certain questions. What’s the purpose of your embroidery project? Are you stitching something purely decorative, to hang on a wall? Are you embroidering a table cloth, sheets, a pillow case? Are you embellishing a wedding gown? A winter skirt? A coat? Are you stitching upholstery for a chair or a footstool? Or a cushion for your sofa? Understanding how you intend to use your finished project will go a long way towards helping you decide what ground fabric to use. What type of embroidery are you doing? The type of embroidery that you’re doing will influence the type of fabric you choose for your project. Because surface embroidery often features curved and flowing lines, it makes sense to choose a fabric that will allow you to embroider smooth curves. Besides curved lines, surface embroidery often involves filled spaces which require closely worked stitches. Think: satin stitch, long and short stitch filling. To accommodate this type of stitching, fabric that has a full weave is best. By full weave, I mean that the warp and weft threads of the fabric fill the surface, without leaving noticeable gaps between them. Exceptions are made for very delicate stitching that might be done on open, airy, gauzy fabric, but for most surface embroidery styles, a surface with a full weave will serve best. While counted work (counted cross stitch, blackwork, Hardanger and the like) benefits from even-weave fabric that features little holes at the intersections of the warp and weft threads, with surface embroidery, this spacing isn’t as desirable. How dense and heavy will your stitching be? Will your project be heavily stitched, with a lot of dense fillings? If so, you need to keep this in mind when choosing a ground fabric. Dense filling stitches demand a hearty fabric that can support the stitches. A light, flimsy fabric is rarely suitable, for example, for crewel embroidery, which often incorporates heavily filled areas stitched in wool threads. At the same time, a very heavy fabric for fine, light, delicate stitching might be overkill. Once I’ve answered the questions above, narrowing the purpose of my project and its characteristics, I consider fabric options. I prefer a fabric that has a full weave – that is, the warp and weft threads fill the fabric surface without leaving in noticeable gaps or irregular spaces between the warp and weft threads. For surface work, I generally avoid fabrics made specifically for counted needlework (cross stitch, blackwork, Hardanger, and the like). These fabrics have their place in needlework, but they aren’t conducive to creating the smooth, flowing lines that are often typical in surface embroidery, and the spacing of the warp and weft threads make it difficult to place a stitch exactly where you want it to go. I also pay attention to the structure of the weave. Twills (like linen twill), satin weaves and the like are great for embroidery, especially when a heavier ground fabric is desired. Some types of embroidery (drawn thread work, for example), though, won’t work on certain weaves. “Hand” refers to the feel of the surface of a fabric when you run your hand over it. For surface embroidery, I prefer a fabric that has a smooth hand, without a lot of bumpiness, slubs, or too much texture. There are definitely times when texture is called for, but I find that too much texture, too many slubs, too many surface irregularities can interfere with the embroidery stitches. I’m a huge fan of fabrics made from natural fibers. My fabrics of choice include 100% linen, silk, wool, cotton, and, occasionally, blends made from these fibers (i.e. wool / silk blends, linen / cotton blends, silk / cotton blends). I tend to avoid fabrics that are synthetics or synthetic blends. In general, I find them spongy, hard on the threads (synthetics tend to be abrasive on fine threads), and I don’t like the feel of them. This is a matter of personal preference, I think. There are many synthetic blends out there that are used in handwork. Lugana and Jobelan, for example, are used in counted work. They’re both rayon / cotton blends. Trigger cloth used in Brazilian embroidery is a polyester / cotton blend. While they might not be my fabrics of choice, they are still highly favored and frequently used by experienced stitchers. When it comes to linen and cotton, especially, I look at the thread count of the fabric, too. Low thread-count fabrics (especially even-weaves made from linen) are not always the best choice for surface embroidery. However, if the weave fills the whole surface – if the threads of the fabric are plump and full – then a low count linen can suit fine. For cotton, a higher thread count cotton (plain weave) like muslin, some quilter’s cottons and the like make a good ground for certain types of projects or a good supporting fabric. Again, the project itself will influence what type of fabric weight I look for. If I’m setting out on a crewel adventure, I don’t want a flimsy fabric. I’d look for a good linen twill or a medium to heavy regular linen. If I’m stitching some very delicate, light whitework project, I’d probably not go for a heavy fabric. It would be overkill. Essentially, you want a fabric weight that will support the type of stitching you intend to do. Sometimes, if the fabric is “just perfect” – but you question whether it’s going to be hefty enough for your project – then you can back the ground fabric with cotton or linen for extra stability. Sometimes, you know exactly what color fabric you want, but you might not be able to find that color in a suitable fabric. Or sometimes, you might know exactly what fabric you want, but it only comes in colors you don’t want to work with! In any case, color is a consideration. For most of my embroidery, I’m pretty darned dull when it comes to color choices. I like white, off-white, oatmeal and other “natural” colors for linens, and with silks and the like, I tend to go with lighter colors. Occasionally, though, I might choose a deep, dark, or vibrant background for a project, but I don’t normally like stitching on very dark fabrics. Part of the reason for this is the whole blogging thing. It’s more difficult to photograph projects on dark backgrounds, and when demonstrating techniques, it’s much easier to see what’s going on, on white backgrounds. I’m sure I’ve overlooked some considerations here, but this is pretty much where I start when I’m thinking about fabric. The more you work with fabric and threads, the more you get a feel for what works well together. The process of choosing, then, becomes less difficult. Over time, you’ll definitely end up with favorite fabrics, but I think it’s important to experiment with other ground fabrics now and then. Different fabrics are a great way to add a little spice to your needlework life! What characteristics do you look for in ground fabrics for surface embroidery? What types of fabric do you like best? What do you tend to avoid when choosing a fabric? I’d love your input on the subject! And I think the discussion will come in quite handy for those who are still finding their way through the wide world of fabric choices. If you’d like to join in, feel free to chime in below! If you enjoyed this article and you’re looking for more inspiration, information, and instruction on hand embroidery, why not sign up for my daily newsletter? There are all kinds of reasons to have Needle ’n Thread delivered to your inbox – check them out and sign up today! My favourite fabric to stitch on is 100% silk for most embroidery, surface, silk shading, gold work. I also like linen and 100 % cottons for white work. However, I I have stitched on just about everything if it was perfect for the project. Dear Mary, I use 200 count 100% cotton mostly for my needle painting. Because I do a lot of stitching in a small area to get the shading right it is essential that I have tightly woven and fine fabric to carry the all the stitches. To add more body to the fabric I use a fine voile as backing. I have never tried silk as it is a bit pricey, that is if you can lay your hands on it in my country. I’ve never thought to use voile as backing. Thanks for the suggestion. For me, the first consideration is the purpose of an embroidered piece. If I’m sewing, say, an evening bag that will have beading incorporated into the embroidery, then I am most likely going to use satin twill, velvet, or heavy silk for the exterior, but then I might use a found or recycled fabric from another garment. For the fabric-covered embroidery box, I made an odd choice of fabric to embroider on: indoor-outdoor upholstery fabric. For that project, it worked beautifully, because I needed a sturdy fabric that could take a lot of handling and support the structure, but it would never work for, say, blackwork or a purely decorative piece. Speaking of blackwork: I’m (still) in the planning stages for a very large piece, and blackwork dictates an even weave fabric. I purchased the largest cut of embroidery linen I could find. This piece will be blocked and stretched over a large frame for display, so the fabric must be one that will not only work for counted thread work, but one that also will not lose tension and sag over time. So linen it is, especially since I might add sort-of Assisi stitching in there. Am I embroidering a garment, such as a cotton muslin peasant blouse, a lightweight denim shift, a smocked bodice, or a wool gabardine jacket? In that case, the fabric determines the embroidery thread and design, and not the other way around. What if I’m combining different stitching techniques? I’ve combined surface embroidery with cutwork and drawn thread in a single piece, so for that, I have to use an even weave fabric, and then determine what weight. I probably wouldn’t use the same fabric for a table runner as I would for a Baptismal gown, even if I’m using the same techniques in both pieces. I’ve embroidered on quilting cotton (for example, the Stitch Sampler monogram, which I still haven’t managed to add to the Flickr page! ), cotton toile, linen, rayon, muslin, silk, voile, denim, batiste, wool, felted wool…in fact, any fabric without nylon or in a poly blend. In other words, I’m pretty much echoing what you wrote! Surface embroidery is the type of needlework I aspire to and so I choose and I prefer natural fibres and close weave fabrics such as 100% linen like Alba Maxima or Alabaster Angel a full weave and I find the weight of these fabrics supports surface embroidery very well and I find these fabrics easiest to work with. Or 100% cotton, silk fabrics which I prefer. I have tried cheaper linen fabrics but they are very flimsy and difficult to stitch on. I don’t like working on dark fabrics as the stitching is difficult to see, as well as the difficulties of transferring designs on darker fabrics. But I have used other colours such as red, yellow and green fabrics which are fine for surface embroidery. I also used voile for tambour work but again 100% cotton which was easy to work with. But these are purely personal choices which suit the type of embroidery I choose. Thanks for sharing your views on fabrics for embroidery a very interesting article. so happy for this topic as i wanted to ask you about fabric choice for a new project i am planning. it is a quilt pattern that is worked with felted wood and quilt fabrics that you applique the pieces with matching cotton floss using the blanket stitch to the backing fabric. the blocks measure 12″ x 16″ and i have decided to make pillows instead of a quilt. so this article was very informative. i am thinking i should use a good linen twill. not sure if it will work with felted wool. any suggestions. would alba maxima by legacy be a good choice. the finished project is a decorative pillow. Most of the felted wool projects I have seen use felteed wool for the background. I do have a small project that uses even-weave wool as a background. I think your fabric choice would be good for the pillow. A wool-silk blend or a wool-cotton blend would also be good, especially if you’re using true felted wool (as opposed to synthetic craft felt). I’d also suggest floche or perle cotton for the embroidery instead of stranded floss. Just my two cents. 100% wool is a dream to embroider on. Just look to the work of Sue Spargo. Along with the great tutorials on Needlenthread I have gone from a quilter to a lover of wool embroidery. I generally use either cotton or silk but also back them with thin cotton. I consider how dense the weave is of the base fabric and what kind of stitching I am going to do. Embroidery with a lot of stitches tends to ripple tightly woven fabric. My favorite for embroidery is silk DuPont with silk threads. Je choisis toujours du tissu en fibre naturelle, par contre mes choix de tissus ne sont quasiment jamais fait pour la broderie, trop légers, trop lourds, trop présents dans la texture de la trame, mais j’aime ça. Par vraiment pratiques pour les points de broderies, le résultat est toujours surprenant et je trouve souvent le moyen de recycler mes beaux tissus, en appliqués, en insertions dans une dentelle. Néanmoins, oui un beau lin, un beau coton en adéquation avec le type de broderie que l’on souhaite et surtout avec le bon fil, et bien c’est parfait. Je trouve que nous n’avons pas réellement le choix en fait, donc je teste avec beaucoup de travail et de malheur mais aussi avec de belles surprises!. thank you for opening up the discussion on this topic again, Mary. What a timely article! Currently I am researching, examining and test stitching various fabrics to stitch a spread for a queen-size bed whose top dimension is 60 x 80 inches. At first, I was going to either stitch individual 5 – 6″ squares and then went on thinking about 10 – 12″ squares of geometric blackwork or hardanger. I quickly nixed that idea because I will probably be dead before I finish all those squares. I have now settled on a center medallion type design, Le Jardin de Plaisir by Long Dog Samplers but with an alternate colorway than what is suggested on the chart and stitched on either a 7ct Klostern, 10ct Tula or an 11ct aida. The problem I am having is the fabric colors available or fabric content. Klostern and Tula are rayon and cotton blends and the aida is 100 percent cotton. The stitching will be completed with either size 3 or 5 perle cotton. Mary, if you or any readers of this see a problem or issue, please feel free to comment. Any and all input will be appreciated. Several years ago I bought a pre-made tote of pure linen from Sajou. I embroidered my initial on it, using satin stitch. I was very unhappy with the result, as I couldn’t get my stitches to look smooth. Up til then, even though I have been embroidering for years, I had never really thought too much about fabric weave and weight, and what type to select for various stitches. I guess I had been lucky! I really thought I was losing my embroidery skills. It was depressing! Then I realized that the fabric wasn’t suited for satin stitch, but would be marvelous for various other decorative stitches which don’t require an even outline. I neatened up the appearance of my initial stitching with a small contrasting back stitch around the outline. Then I went and looked at all my other embroideries which turned out well. That made me feel better :)) ! Apesar de ainda estar “deixando as fraldas” na arte do bordado, já tenho minhas preferencias que é a cambraia e o linho. Para testar pontos novos uso 100% algodão na cor branca ou percal. When I was taught to do Brazilian embroidery, my teacher was using sailcloth. I still purchase off white and white for my projects. It washes up beautifully after stitching the pattern. Where in the US can you buy it? The store that used to sell it in Portland went out of business. I just started a class project on a very sheer even weave fabric…even though it calls for cotton/llinen. Coming from a machine sewing background as well as handwork I have had exposure to “lots” of different types of fabrics… I am able to use these sheers because of a 100 % cotton fusible backing made by Pellon…it stabilizes the sheer fabric and allows me to do a heavier stitching on the sheer..The fabric stays very drum tight on your frame…I am enjoying a different look as this piece I am working on is not your typical pillow/ picture…it will be made into a cap…I am hoping all goes well with it as it has a lot of fine detail…the course is ” Trevelyon”s Cap Course” with Kathy Andrews..should take me around a year to finish it….Whhew! Thanks for this. I haven’t taken enough time to evaluate my fabric in relation to what I plan to stitch. This is really helpful. I like your pictures you’ve been using lately — like the one for this article! While I generally use natural fabrics like linen and cotton twill for surface embroidery, I am not adverse to using polyester or other synthetic fabrics. I actually found some lovely blue moire ,drapery weight, at the thrip shop which I used for several”water” oriented designs and some small bits for needle books etc. perhaps thread wear is not a problem for me as I tend to use fairly short thread lengths. Also found some blue-green shot satin that worked really well on either side for several projects. There is very limited resources for fabrics in the area I live and importing specialty fabrics would be out of my budget. Hello Mary, first a huge thank you for your blog and the treasures therein, you are my virtual BFF.I would like to ask you what is the fabric you use for your demonstration photos and tutorials. It appears to be the perfect fabric for practicing stitches. Further to the BFF theme I would like you to know that as with all BF’s you have been assisting me with spending money, yesterday I received my book Tambour Work by Yusai Fukuyama, the hooks on their way as is the Millenium Frame ( be still my beating heart).Warning: I think my husband has put a price on your head! I have embroidered on paper and on leather, cotton, poly, linen – evenweave, uneven weave, no weave, and I don’t know what. When I started doing needlework (before age 5) I was doing kits so there was no choice. The first piece I made that was original I was still in elementary school or junior high and had no idea of fabrics. It was made on a leftover piece of curtains my mom had made for the dining room – slubs and all. Not appropriate for stitching or it’s purpose (a religious bread cover). As I went along and started doing more piece which were original I still did not know about fabrics and used whatever was at hand or I could easily buy which was white or off white. Strangely this worked well for almost all of the projects. I have some assorted needlework fabrics which have been purchased over the decades by my husband (yes, he does needlework – now mostly miniature punch needle – totally different kind of fabric) and myself. I tend to pull out what I have and look through it and decide based on the size of the piece, how heavily woven it is, what the purpose of the needlework is, etc. I am limited in what is available locally and ordering things is a major problem due to delivery problems on my end, as well as the fact that I like to see and touch what I am buying. I did a biscornu kit from Sweetheart Tree with my EGA chapter (a rare counted piece for me). I decided after stitching it that it was too nice to hide the back/bottom, so I set out to purchase additional matching fabric. There is a counted work shop in my area and I contacted her by email. She told me that she did not have the fabric, when I emailed back and asked if that meant it was out of stock or she did not carry it, I received no reply. On a trip to Williamsburg, VA (I live on Long Island, NY) I went to a counted work shop there that I knew of, to buy the fabric, which they had one small piece left, as the December embroidery seminar had just ended. I have a new project in mind that involves stitching on what was originally a “Blossom” hat (as the TV character wore). I had bought it, not realizing that was what it was, decades ago – the flower removed when I found out what it was. It is denim and I wear it when traveling to keep the sun off. It folds and can be shoved in a back pocket. I am thinking about embroidering it with pictures of where we normally travel and, perhaps, miniature generic pictures of the cars we have traveled in. So I guess my answer still is – anything and everything. Speaking as a counted styles specialist, there’s more to look for in a ground than thread counts, equal counts for warp and weft, and the presence (or absence) of the prominent “helper-holes” of Aida, Fiddlers’ Cloth, or Hardanger. Mary’s advice on building a swatch library is spot-on. It’s almost impossible for me to choose a cloth without handling it. I do prefer all linen to linen/cotton; and I prefer both of those over all cotton. I do not stitch on polyester/cotton faux linen-look fabrics because I do not find their look or durability commensurate with the effort involved. Thickness of the warp and weft threads, and thread count per inch are all important. For some styles a relatively tightly woven fabric of thick threads may be more appropriate than other styles, which work well on a more gauzy weave made from thinner threads, more widely spaced. The nature of the fabric’s threads themselves can also play a big role. Some linens are distinctly hairy, even slubby. Others feature more uniform, evenly spun or tightly twisted threads. I tend to avoid “fluffy” or very slubby rustic type linens, preferring the crisper fabrics for a more precise look. And some of the crisper fabrics have a sheen to them – their threads having been heat-manipulated in some way. In some cases, this sheen is appropriate, in others a more matte finish looks better. Also, I do not always use 1:1 ratio even weave. Sometimes I play with the pattern distortion produced when one stitches on something that’s got more threads in one direction than the other. Back in my youth, I stitch on fabric for the clothing I was making or leftover scraps from clothing. Then I got into cross-stitch and other types of stitches on even-weave fabric. So, what I now have on hand is even-weave fabric. That’s what I’ll be doing surface embroidery on. I have a pattern transferred onto quilting fabric; that’s what the pattern called for-it will be a pillow. I haven’t started stitching it, yet, because I wasn’t sure of using that fabric. After reading your article and the comments by others, I’ve decided that it is suitable fabric, so I should start it, soon. Great discussion on fabric. This is a subject I want to know about.. As a beginner I want good low cost fabric. If I make a mistake, I learn and not too much loss. Suggestions for beginner fabric welcome. Even though I speak low cost, quality, and ease of stitching are crucial too. If you’re talking about freestyle surface embroidery (as opposed to counted stitching, like cross stitch and blackwork), I think a good quality muslin is a good beginner and practice fabric. I still use muslin quite often. You can get good muslin for well under $10.00/yard. I’m wondering whether you have had time to review my two emails, one sent on the 10th the other on the 15th. I have my black silk material ready and the pattern transferred in white and I’m anxious to begin. My question was how much silk Mori do I need to order to complete my hummingbird design in white? After reading today’s blog on your niece’s work I’m wondering whether the Soie d’Alger thread might be a better choice. I have never used silk thread before and as this is to be a wedding gift for my grandson, I would like it to be as perfect as I’m able to accomplish. Hi, Marjorie – I have your email slotted to answer today, but I’ll just answer it here. I’m not sure about amounts. I’d say if you got the larger hank, you’d only need one of them. But I’m not sure – it depends a lot on how dense your stitching is, what type of stitching you’ll be using, and so forth. If you can get a hank rather than several small skeins, I think that’s better, because you’re assured of consistent dye lots. I prefer Soie d’Alger to the silk mori, but I think you would have to try both to find your own preference. They’re both stranded silk, so they are both easier to use than, say, filament silks. Hope that helps a bit! I love to embroider on soft wool felt fabrics. I like to combine embroidery with felt applique for my projects. Thank you for your clear tutorials and beautiful stitching ideas! In reading the comments from other stitchers I have noticed that many say they ‘back’ lighter weight materials. I’m using a Saxaphone silk shantung for my next project and wonder whether this should be backed and if so, how do I do it and with what material? I’m relatively new and seem to have yet another question everytime I turn around! Hi, Marjorie – well, it really depends on how dense the stitching will be and what kind of stitching. If you’re doing heavy embroidery (lots of filled areas, for example), shantung would be a fabric I’d back with another fabric, like a lighter weight linen or cotton muslin. It just gives more support to the stitching. Also, if you’re doing anything like goldwork – even if you’re not doing heavy stitching with the goldwork – I’d still back it, to give some extra strength to the fabric. When you back the fabric, essentially you just take a lighter cotton or linen, make sure it’s cut on the grain (not the bias), and frame it up at the same time you frame up the silk, making sure that both fabrics are equally taut on the frame or in a hoop. You can baste around the outside of your design area (with silk, keep in mind that the holes from basting stitches may show, so you don’t want to baste it where the holes would be visible when the piece is framed or finished). Thanks Mary for the useful info. The project I’m speaking about is of course my hummingbirds done in white silk thread on my black material. I’m thinking because it is all white thread that I will have many, many, different types of stitches with most of them filled to give it clarity. So I guess my answer is yes I should back it. Because the material is black I’m assuming I should use a black backing material? Yes, Marjorie, I’d probably use a dark fabric. I’m a 100% cotton girl! I use different weights of cotton muslin. This article is helpful, but could elaborate a bit on thread count please. For example, if using legacy linen, 40 count, it would be best for ? Hi, Bonnie – well, since I mostly concentrate on hand embroidery (surface embroidery), that’s what I would use the fabrics mentioned in this article for. 40 ct legacy (Alba maxima) is a great all around linen for most surface techniques. I use it for just about every type of surface stitching. Have you ever used linen twill for goldwork? I know linen twill is mostly used for crewel, but I’m tempted to try this out. It’s a very good quality linen twill I got from Hedgehog Handworks. Yes, I have! This one: https://www.needlenthread.com/2010/04/goldwork-embroidery-project-step-by.html And it’s the same twill that Hedgehog carries. It’s excellent for Goldwork! I am starting a new project and have been searching high and low for Hardanger 22 without a lot of luck. I finally found a tube on eBay. I’m very distressed that counted thread fabrics are so hard to find. I prefer to use this size and not Aida. I also can’t seem to manage reading a graph to work over two threads. I live in Maine and the needlework stores are few and far between. The few we do have are slowly disappearing. Would be able to recommend a company or place to purchase (on line)? embroidering with silk ribbons, 2,4 & 7 mm what type of silk fabric is best? It really just depends on what effect you want. You can use any type – just adjust the type / size of your needle to handle the weave of the fabric. I like dupioni, personally, or shantung. But you can go very light and sheer with organza or anything, really, or very heavy, with silk satin. Have you embroidered on 100% wool challis or 100% wool flannel? I found some at the wooly thread for $39/yd and thought about doing a crewel embroidery on the wool challis for a shawl. What do you think? Yes! Both work well as a ground fabric. Wool flannel is more for blankets – like crib blankets or lap blankets. I think the wool challis would work as a shawl. I have been asked to make a christening blanket out of a satin wedding dress. I would like to embroider a cross on it. Would you recommend this and if so, what type of thread and needle should I use? Hi, Ann – I’m not sure how well satin would work for a christening blanket. I suppose as a decorative cloth cover – unless you’re planning on backing it with something soft, with a little weight. Your thread choice depends on a lot of things. Normally, I’d stitch in silk on silk, but if the “blanket” will need laundering, that could be problematic. So you could go with cotton. The size of the needle (which should be a crewel or embroidery needle, with a sharp tip and elongated eye) should correspond with your thread choice.